A Miinter hitch, or a belay device such as a slot, tube, or Bachli, is easy to set up and efficient in use. Many ice climbers use such a method as standard procedure. The mechanism is usually situated at your seat harness (fig. 14-42), though you also have the option of belaying directly from the anchor. 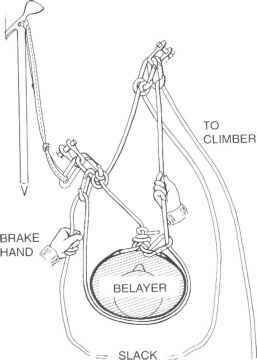 You can establish a hip belay as you stand facing the ice by running the belay rope through a control carabiner at your waist, around your back, through an extra carabiner on the first screw, and then into your braking'hand (fig. 14-43). This arrangement is especially favored when the rope is stiff and frozen and could jam in belay devices. jab the rope. Bring the belay end of the rope over your instep, around the back of your boot ankle, and into your uphill hand. You control friction on the rope by the amount of wrap on the ankle, much as in a boot-axe belay. You can also adjust the space between the edge of the boot and the outside edge of the carabiner. If the climber falls, slowly tighten the rope low against the ankle with your uphill hand. 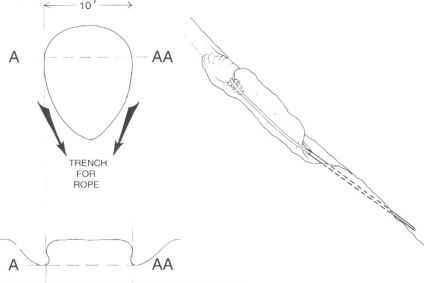 Helpful variations of the boot/ice-screw belay include two that utilize the Munter hitch. Use a large pear-shaped carabiner, which has the correct diameter for the Munter, instead of a standard carabiner. 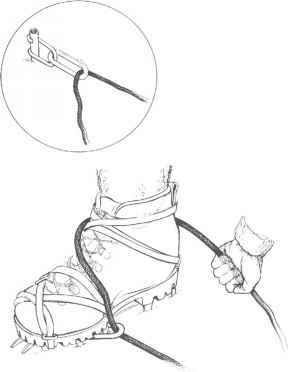 In one method, simply use a Munter hitch at the carabiner instead of running the belay rope around your ankle (fig. 14-45). 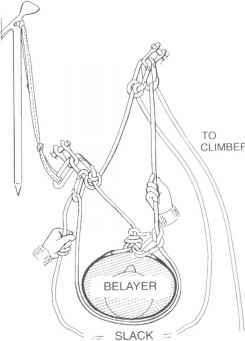 Another method permits you to operate the belay while standing (fig. 14-46).